My husband and I bought a home over the summer that I naively believed was NOT a fixer-upper. Yes, it’s older (built in 1965). Yes, there were some things I wanted to update. But I didn’t imagine I’d be living in a construction zone for almost three months or that I’d only feel finished with all my projects this week! This was the biggest chore (for me) and what I’m most proud of. The original kitchen had two-tone wood cabinets that were dark and old-fashioned. My hubby felt they reminded him of a trailer or a boat cabin. They definitely weren’t our style! LOL Before the floors even went in, I removed all the cupboards, sanded all surfaces, then sprayed everything what was supposed to be an elegant, sophisticated blue-gray color. It ended up with a bit more lavender in it than we expected, but I love my kitchen! It’s much brighter and fresher while still keeping the kooky 1960s style and function. The house came with wall-to-wall baby blue carpeting (even in the bathrooms!) that no one liked. I wasn’t sure, but it looked and smelled like the 1980s. This was our first priority to change. My hubby and I tore out all the old flooring ourselves and then hired an amazing crew to lay wood-grain tile throughout the entire house. Except in my daughter’s room. 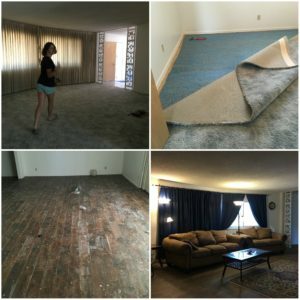 She had to be unique and requested new carpet. After a few cleanings, the floors are unbelievably beautiful! It makes the rooms look bigger and will keep us cool in the summer. Bonus–they’re much easier to clean with kids and dogs running around. 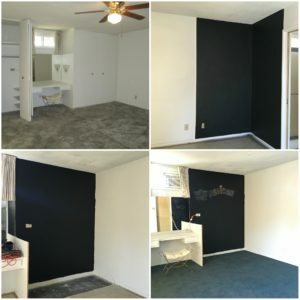 My daughter got into the remodeling game, too, requesting to remove part of a closet to add more room, to put up blackboard paint on two walls, and installing new turquoise carpet. It all came out beautifully. The one thing our master suite was missing was a true walk-in closet. So, though the cost really ate into our budget, we went ahead and hired a contractor. I’m so glad we did. It was worth every penny. On top of everything else, there were plenty of smaller projects to take up my time. 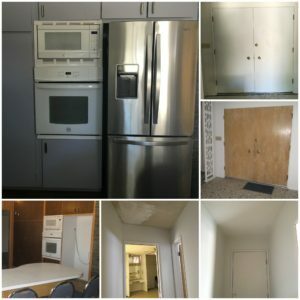 Everything from painting to installing a new fridge with a water line. I’m not ready to get my contractor’s license and flip houses, but the experience has been fulfilling and educational. I’m excited to begin living in the house rather than working on the house. I’m looking forward to years and years of comfortable, happy existence. 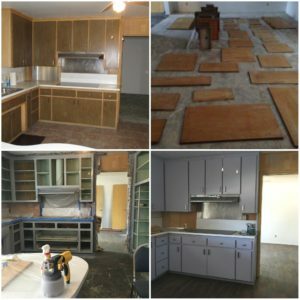 Do you have a remodeling story? Share in the comments! P.S. 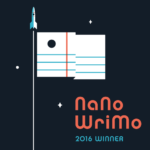 I’m headed back to work on Beasts of Vegas #3, my NaNoWriMo 2016 project. Only 7 days until deadline. 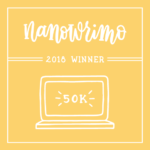 My current word count => 37,000. 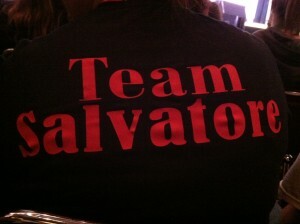 I can’t stop smiling after The Vampire Diaries convention in Burbank last weekend! 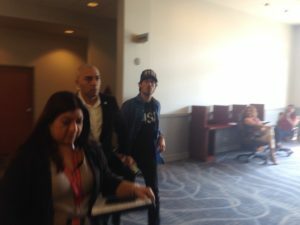 I not only got to hear panels from stars of TVD and The Originals, but I actually got to meet and talk with Ian Somerhalder, Damon Salvatore himself! It was a dream come true. 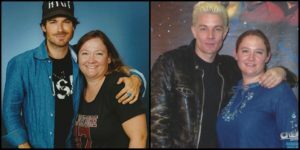 Back when Buffy the Vampire Slayer was still on the air, I went to my first fan convention in Pasadena, CA and had my photo taken with Buffy’s bad boy vampire, James Marsters (Spike). Anna and James snapped back before cell phones were banned from the photo op room. 😉 Don’t you love his leather jacket? 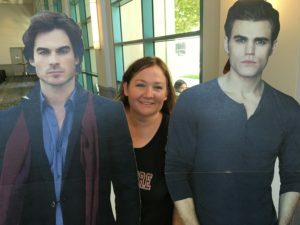 Sunday, I ran into Damon and Stefan Salvatore (or their cardboard lookalikes). I wonder if they’re actually that tall? 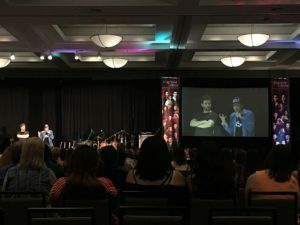 First up, Michael Malarkey (Enzo) and Chris Wood (Kai). 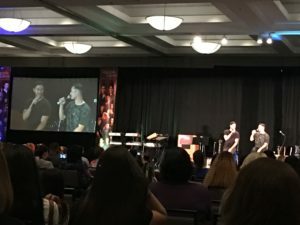 They spent the entire panel making jokes, singing, and beatboxing. It’s too bad their characters never shared a scene on The Vampire Diaries because they were hilarious together. 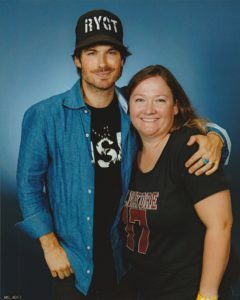 Then, the highlight of the day (maybe the year)–cozying up to Mr. Somerhalder. 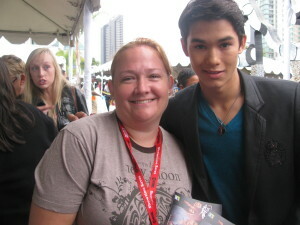 He was so charming and polite, giving each lady in line (and there were hundreds) personal attention. 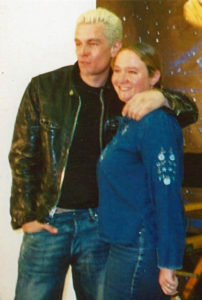 He gave me a high five for being a writer and made us all, in the ten seconds or so we stood next to him, feel special. Afterwards, I was slightly euphoric. Here are my two bad boy vampires. 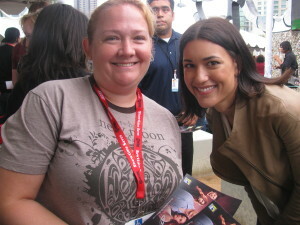 I feel so lucky to have met them both. Their characters and storylines have definitely influenced my writing, including the Beasts of Vegas Series, and my career. Anna with Damon Salvatore and William the Bloody–the original bad boy vampires. 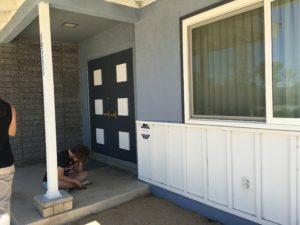 Hopefully (knock on wood), our house-hunting roller coaster is over because one of our offers has finally been accepted on a wonderfully weird ranch-style home in Apple Valley, California. I’m so excited and relieved to be moving forward and putting down roots after relocating back and forth across the country as a US Marine Corps family for the past fifteen years. Our road to our forever home, though, has been a bit bumpy. After our first round of searching and seeing houses with our shiny new real estate agent, this home was our absolute favorite. An investment company had gutted a 1950s home and remodeled it from the inside out, even adding a pool. It had two master bedrooms and an office with French doors leading onto the covered patio. I fell instantly in love. The only problem was, the house was listed $20,000 higher than any other comparable home in the (not so nice) area. We’d be living in the nicest house on the block. For example, the yard next door was a junk and salvage yard. So, we made an offer for $15,000 below asking price. Though the home had been on the market for more than a month, the investment company refused to even acknowledge our offer. We had to walk away. This gorgeous home we dubbed “the mountain house” because it sat under tall, rocky hills was our second (and more realistic) choice. 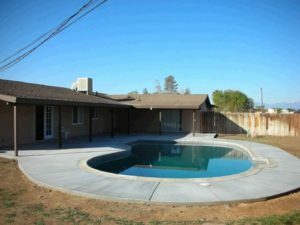 It didn’t have a pool, but it was very well cared for and the acre lot was nicely landscaped from front to back. Bonus, it was in an excellent neighborhood. We put in an offer for full asking price plus 50% of buyers’ closing costs. The owners verbally agreed. We were in! Sometime that night, another offer came in. 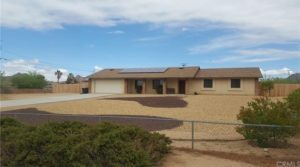 We were using a VA loan, which required the sellers to shoulder a bit more of the costs as well as a 45-day escrow. The new offer was a conventional loan. The couple accepted the other offer, and we were out of luck for the second time in one weekend. This was my husband’s favorite. It’s a beautiful home, inside and out, with lots of clever design features that make it a superstar. Covered patios, wireless speakers in every room, and remote controlled security gates, for example. Plus it had a pool. We had to walk away. My husband is still upset about it. I admit, by this time I was feeling frustrated and disappointed. Three weeks of going out, seeing houses, making offers, and waiting on pins and needles had frayed my nerves. House #4 was no one’s dream house, but it was perfectly suitable. 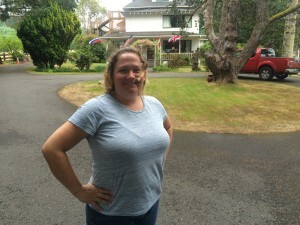 It had two master bedrooms, a family room, and half an acre of land on a corner lot. Also, it was about $50,000 cheaper than the first three properties. It had also been on the market for two months, so we assumed the owner would be happy to receive an offer. We made an offer for full asking price plus 100% of buyers’ closing costs. The sellers’ agent got back to us the next day. 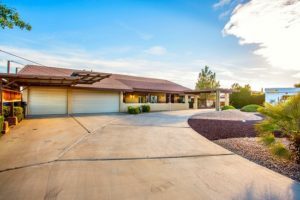 Though it wasn’t mentioned in the listing, the seller would only sell the home “as is.” He refused to pay a cent, though our VA loan requires the seller to pay for certain reports and any lender-required repairs necessary to fund the loan. I was so desperate, I said we’d still buy the home if he simply agreed to pay for any possible repairs the lender required (with the chance there would be none), but he said no. We had to withdraw our offer. This was the first property we saw on our house-hunting trip that day, 3 and a half weeks into the process, and I fell immediately in love. We all agreed it was perfect for our family. It boasted an acre of land, two master suites, a covered patio, new windows throughout, and a living room the size of a skating rink. On top of all that, it was built in 1965 and has the strangest, kookiest interior of any house I’ve seen. It’s full of little nooks and cubbies, plus built in bookshelves, desks, and vanities unlike any I’ve seen. At each subsequent home we saw, we used House #5 as a measuring stick. After seeing five additional homes in our price range, this was still our favorite. 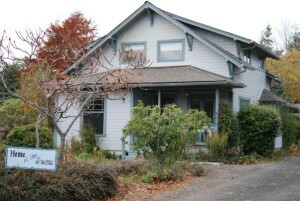 We made an offer for full asking price on Friday and crossed our fingers. Unfortunately, the seller was out of town and wouldn’t be available to consider the offer until Monday morning. So, we waited. On Monday, the seller gave us a verbal acceptance, but he is the executor of a family trust (that owns the house) and he needed to run the offer by his siblings to get their okay. He’d let us know Tuesday if he’d officially accept our offer or not. Another day of waiting and worrying and hoping this was finally it and we’d have a home to call our own. Our agent called Tuesday afternoon with good news. 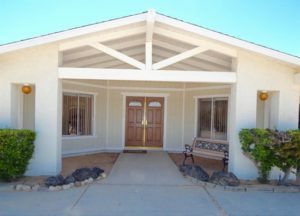 The seller had accepted our offer, and we were in escrow! It’s still early in the process and I don’t want to jinx anything, but I’m starting to make plans for our sprawling ranch style home. The yard has no landscaping to speak of, so I’m considering fruit trees, shrubbery, and decorative rocks. The interior has wall-to-wall carpeting, but with the desert heat and sand I prefer tile. The kitchen is “dated” (the kind word our agent uses to mean old and in need of remodeling) and I’d like to install new cabinets and countertops. But I’m so excited to get started and make this home into our dream home! 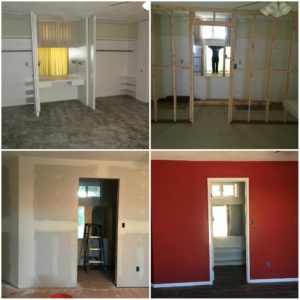 If you have any remodeling tips or stories I’d love to hear them. Check out my Pinterest board for our home remodeling projects. 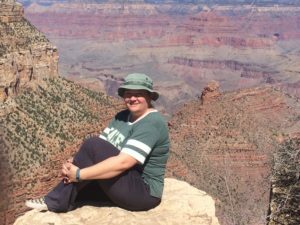 This was my second excursion to the Grand Canyon, but the last time I went my husband and I walked to the edge, saw it, and went back to our hotel room. So, this year I really wanted to enjoy the experience. 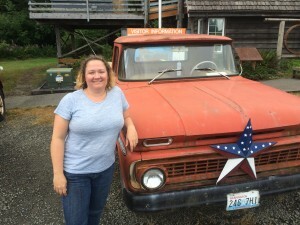 Bonus–it was my daughter’s first visit. We started our adventure in Williams, Arizona at the Grand Canyon Railroad Depot with a live cowboy shoot-out! The train ride was about 2 hours, but it hardly felt that long. 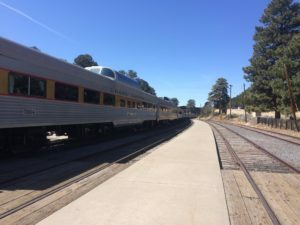 We enjoyed live entertainment and a dining car, plus the passing scenery was one-of-a-kind. It was like a trip back through time to the American West of the nineteenth century. Disposable cameras used to be my only option for vacation pics. Now, they’re a clunky relic of a pre-cell phone world. 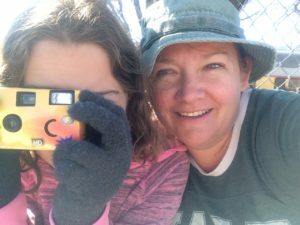 My daughter thought turning the exposure gear and hearing each picture snap was hilarious. After our arrival, I didn’t just want to stand at the edge, I really wanted to spend time in the National Park. I hadn’t planned far enough in advance for burro rides or anything like that (maybe next year! ), but we did take the angel trail toward the bottom of the canyon. 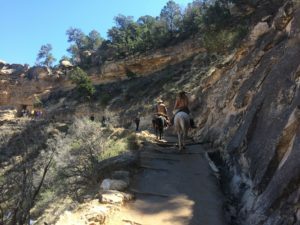 It was so early in the year, there was still snow on the ground, which made the trail slippery, but the cowboys on horseback we passed didn’t seem to have any problem with it. You can see patches of snow in the lower left corner. The views were spectacular, and I’m so glad we slowed down and took our time. My favorite part of the trip, though, was finding the Native rock art along the Angel trail. 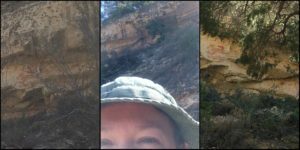 I’m a huge fan of all things historical and archaeological, so I was definitely on a hunt for the artwork from the moment I heard it was visible from the trail. It took a while to find, but I did finally discover red animals, shapes, and humanoid figures on the canyon wall. The Native rock art is red against the pale cream rock. If anyone knows anything more about the rock art in the Grand Canyon, I’d love to hear about it! 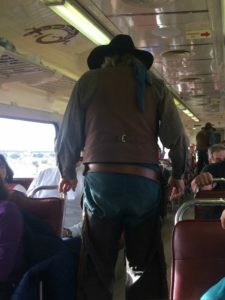 Finally, on our way back to Williams our train was boarded by a nefarious gang of outlaws. Luckily, we all survived to tell the tale. 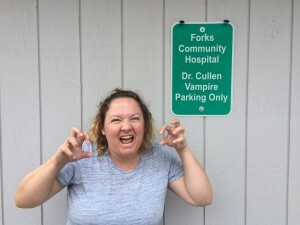 My Twilight Trip to Forks, WA! 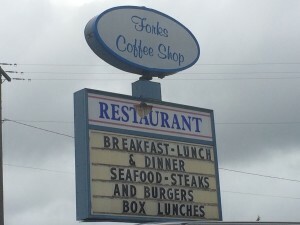 Last summer, I was in Washington and visited Forks. It was so much fun! 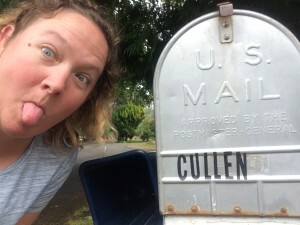 I’ve been a fan of vampires for a long time, and I couldn’t wait to visit the setting for Stephanie Meyer’s Twilight series. 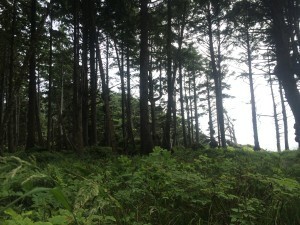 First, it’s very long drive from Seattle through some of the most beautiful, green forests I’ve ever seen. The coast outside Forks, WA. Near the beaches Bella and Jacob strolled in the books. Our first stop was the city’s visitor’s center (well worth the visit!). From there, we used the city’s handy map and found the Swan House. Bella’s windows are on the 2nd floor. Our third stop was Dr. Cullen’s office at the local hospital. 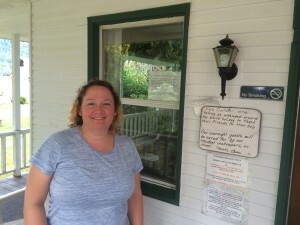 The Cullen House is a bed and breakfast. Esme’s letter to friends and fans. 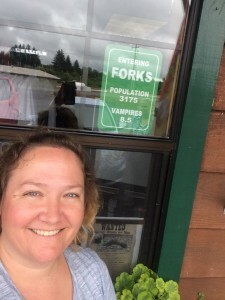 If you’re a fan of vampires, too, I highly recommend a trip to Forks. It’s a bit out of the way, but it’s like walking through the books. It’s well worth the drive. And the town, which saw a huge tourism uptick during the height of Twilight hysteria, could use a boost now that most people have moved on to new fandoms. It’s been a rough few months, but I needed to reach out and explain why I took the second half of 2015 off from both writing and social media. 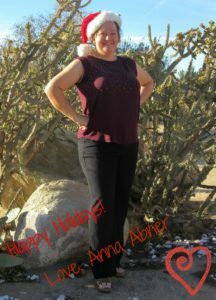 I moved over the summer from North Carolina to southern California with my husband, daughter, dog, and tortoise. It’s been a difficult transition–making new friends, finding a place to call our own, starting school, and feeling like fish out of water. In October I was blessed to start a full-time teaching job, but I went from working a couple days a week (8:00-3:00) to working five days a week (7:00-4:30). To make things worse, I took over in the middle of the year after a teacher quit. It’s been a stressful few months playing catch up. 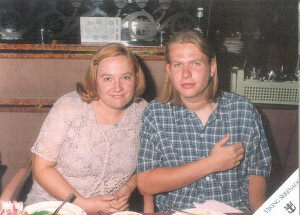 Lastly and worst of all, my little brother passed away in December from complications after a brain aneurysm. 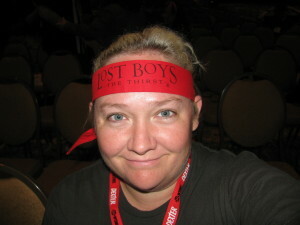 It was so sudden and gut-wrenching, I spent weeks and weeks crying and walking around in a fog of shock. To say I have been under a lot of stress the last eight months or so would be an understatement. I had bouts of creativity. 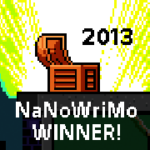 I participated in Nation Novel Writing Month in November. 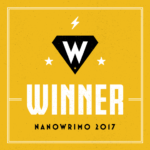 I worked on several manuscripts, here and there, but I haven’t been mentally or physically strong enough to write seriously since last summer. Now, though, I’m relieved to say I’m feeling much better and have started working hard on a new novel in my Red Plague series. 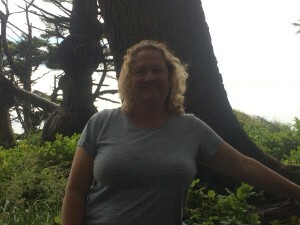 I hope you have all been well since we last connected online, and I look forward to reconnecting in the next few weeks. My brother Will and I.